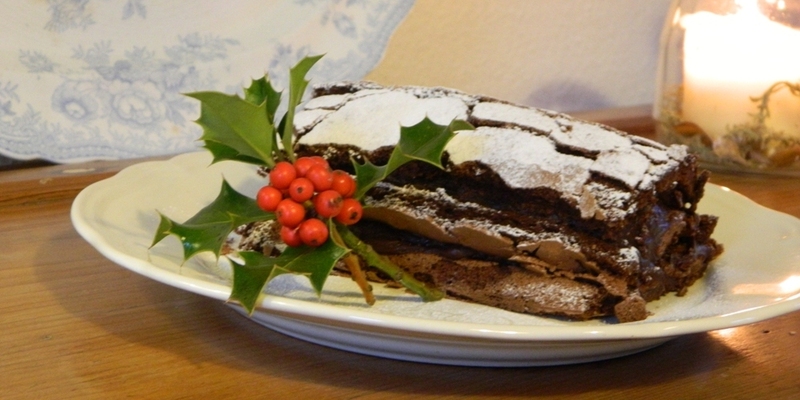 One of the great things about this Chocolate Christmas Log – and there are many ! – is that it is gluten free. Line your swiss roll tin with baking parchment and add the mixture to the tin, shake gently to ensure that the mix is evenly spread and the corners are filled. You will know that the cake is baked, the edges will have just started to come away from the sides of the tin. Take out of the oven, leave in the tin and place a damp tea towel over your bake. Leave for a few hours. Now turn out your cake onto a large sheet of baking parchment, peel off the lining paper. On the short side nearest to you, score the cake, about 2 cm from the edge and start to roll. The cake will crack, but it does add to the character of the finished log. Once rolled dust with icing sugar and decorate with holly for the total Christmas affect.